Folders, Smoulders - you don't need Folders. Think of Tags as a modern more flexible folder idea. That is, a collection of files. ...as ways of organising assets into collections of Assets (pseudo folders). One of the benefits of a no folder approach is that an Asset, can be in many places at once (i.e. have many Tags or Brands), without having to store or manage multiple copies of the Asset. A big advantage over crusty old folders. Note: Licence is the exception here, an Asset can only belong to a single Licence. One of the things you can do with Tags is to create what we call preconfigured Content Stories, using Tags combined with Landing Page widgets and/or custom navigation. 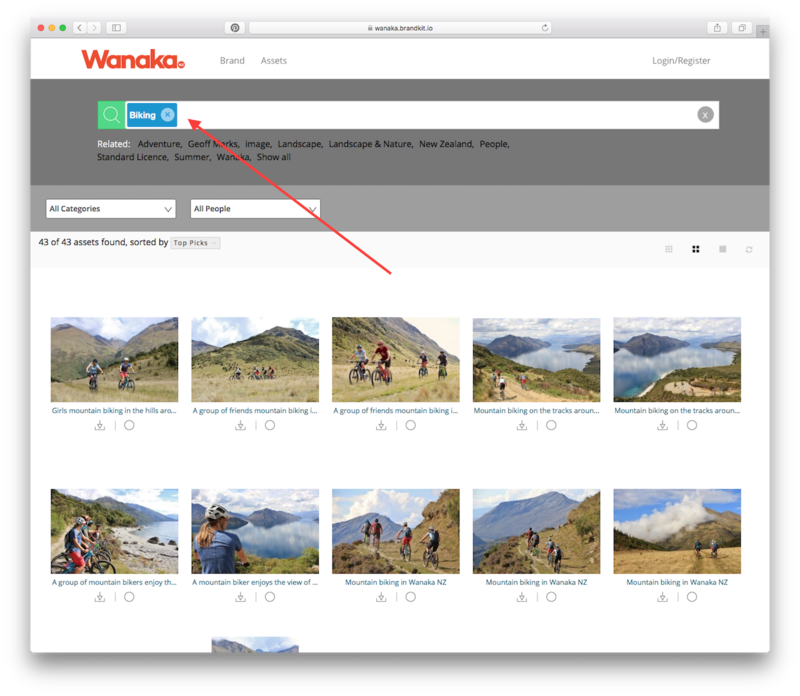 Example of a Tiles Widget with a preconfigured Tag Search (aka Content Story or Visual Story) for Assets tagged with "Biking". ...and the resulting Biking Content Story /Visual Story. These preconfigured searches can use one or multiple tags, and be triggered by a range of landing page widgets or custom navigation/menu items. Talk to your Brandkit Account Manager or Brandkit support on how to set these up in your Portal. Also see this Blog post about Folders.